Religious education plays a critical role in the life and effectiveness of congregations even though, like the membership of congregations, participation in traditional delivery settings is declining. The Sunday school or its equivalent for other faith traditions is still a key avenue for congregations to transmit their teachings and beliefs and provides a stable means for participants to experience nurture and fellowship. This report addresses the topic of religious education by exploring the patterns in our 2015 research and drawing out key insights and action steps for Church, Synagogue, and Mosque leaders, as well as other faith groups. Young adults pose a vexing and urgent challenge for congregations. On the one hand, they are particularly crucial for growth and on the other, today’s young adults are less religiously affiliated, and less inclined toward religious belief and practice than ever before. Using the Faith Communities Today 2015 survey results to explore young adult ministries (with “young adult” referring to individuals 18 to 34 years old), this report highlights major findings from that study in order to gain a better understanding of current trends and characteristics of congregations with flourishing young adult ministries. American churches, synagogues and other faith communities are changing. This report describes the key findings from our 2015 national survey of churches and other religious communities in the United States. It offers a profile of congregational life and presents a comprehensive look at the trends across 15 years of survey findings. Explore this report for new perspectives on worship, conflict, leadership, interfaith involvement, vitality, economic hardships, and other challenges that churches, mosques and synagogues tell us they face. Worship is the central, quintessential act of religion. The worship gathering is the major setting in which people congregate to grow in their faith. This report provides a snapshot of the United States at worship across churches, denominations and faith groups. The picture of worship that emerges from this research report is one of both variety and similarity. Religious congregations are making dramatic strides in adapting to the contemporary Internet technological reality. This report describes the level of technological use by religious groups, identifies the factors that either aid or hinder its use, and highlights the positive outcomes for the congregation that embraces the use of technology. The report also speculates beyond the data to offer several reasons why all congregations should intentionally develop their technological ministry capabilities, no matter how large or small, technologically adept or unsophisticated. Congregations that are spiritually vital and alive have strong, permanent leadership and enjoy joyful, innovative and inspirational worship are more likely to experience growth, a new study has found. Other factors that support growth are being located in the South, having more weekly worship services, and having a clear sense of mission and purpose. 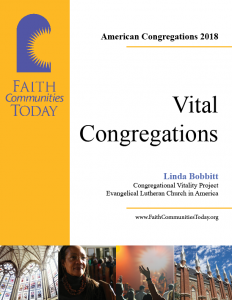 The health of America’s congregations remains a challenging situation, according to a 2010 report from Faith Communities Today. Explore the findings that show that despite efforts at innovation, bursts of vitality and increased civic participation, faith communities are entering this decade less healthy than they were at the turn of the century. Explore the key findings related to the economic health of 11,000 congregations. This report, written by David Roozen, explores changes in interfaith cooperation over the past decade and explores the impact of 9-11 and the multi-faith context of US churches. The analysis is based on the Faith Communities Today 2010 national research. This Faith Communities Today survey finds 68 percent of U.S. congregations hit with financial difficulties due to recession. Explore the key findings related to the economic health of 11,000 congregations. This report, written by David Roozen, explores the financial trends over the past decade and explores the impact of the 2008 recession on US churches. The analysis is based on the Faith Communities Today 2010 national research. This report from the 2008 Faith Communities Today national survey of churches and other religious communities presents a comprehensive look at the findings, including trend comparisons to FACT 2000 and FACT 2005 survey findings, and new perspectives on worship, conflict, leadership, interfaith involvement, vitality, economic hardships and other challenges churches, mosques and synagogues tell us they face. 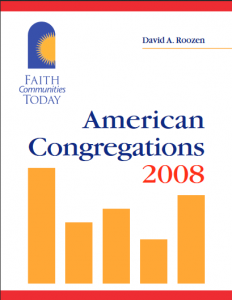 This report of the 2008 national survey of churches, mosques and synagogues in the U.S. looks at the story of change over eight years and demonstrates considerable congregational decline, but also a pattern of hope and lessons to be learned to grow a healthy and vital congregational life. The FACT 2005 national survey of congregations profiles religious life based on the 2005 national survey of congregations. This 30 page report presents a comprehensive look at the FACT 2005 findings, including trend comparisons to FACT 2000 survey findings, and new perspectives on worship, conflict, leadership, interfaith involvement, vitality, the prevalence of strong beliefs (both on the right and the left) and the greatest challenges congregations tell us they face. Download the entire 68 page FACT 2000 research report summarizing the key findings of the FACT 2000 study, written by David Roozen and Carl Dudley. Check out this special report on Church Growth based on the Faith Communities Today 2005 study which explores growth principles and the variables that made a difference in growing churches such as contemporary worship, spiritual practices and being purpose driven. Check out the first product of this special series which offers news, background information, resources and key questions to help congregational leaders study their financial condition and enhance their stewardship. Check out this special report based on the FACT 2000 study which explores America’s Interfaith reality.